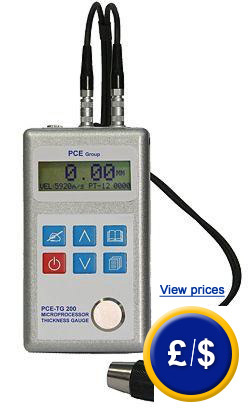 The PCE-TG 200 thickness gauge is used to measure the thickness of metal, glass and standard plastic. This thickness gauge uses an external sound sensor that produces ultrasonic sound waves that penetrate the object that is measured. Different materials allow ultrasonic waves to pass through as different velocities, therefore, you can select between different ultrasonic velocities on the thickness gauge. With this device you can detect the thickness of metal, glass, plastic and other standard materials within seconds. The thickness gauge is easy to operate with only six keys. Thanks to its integrated memory, the device can store up to 4,000 readings. This makes the PCE-TG 200 ideal for the use in quality control as you can transfer the measurement data to a computer for further analysis. The software will export data to MS Excel. An ISO calibration certificate can be ordered separately for this device. If you have any questions, please contact one of our engineers or technicians. At this link you will find every thickness meter we have available to meet your needs. - Memory for storing up to 4,000 readings. 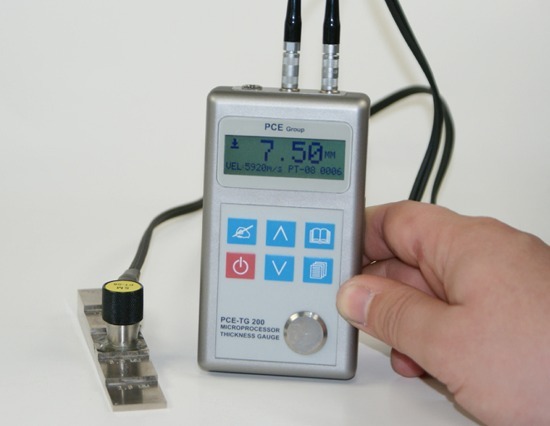 The PCE-TG 200 thickness gauge taking a measurement.